In the extreme metal world, omnipresence might mean that your album was reviewed on two blogs, you were the second of three opening bands on a five-date leg of a Goatwhore tour, and/or you got a small mention in Decibel or Terrorizer. Even with that reduced threshold for hype, records come out on small metal labels every week that get buried for lack of exposure. 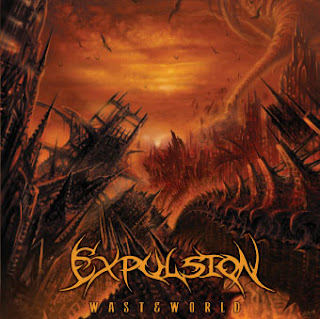 I'm convinced that the anonymity of a band like Expulsion has only to do with marketing. I.e. do more of it, Deepsend Records. There can be no other reason why the band's debut full-length Wasteworld isn't being frothed over by anyone with a functional set of ears and a passion for thrashin'. Competent speed metal bands ain't hard to come by these days. What's far rarer is a speed metal band with a novel guitar style. That's where Expulsion distinguish themselves. Wasteworld's most delirious songs pile a frothy meringue of melodic counterpoint atop energetic death-thrash tremolo picking (check out 0:36 to 1:13 of "Neoconomicon" for an example). I've heard this compound "string-skipping" technique employed by emo-metal bands like Fall of Troy (reviewed here) and Human the Abstract before in uber-showy fashion, but never so well integrated with raw thrash as it is on Wasteworld. The thrilling thrash sections of "Land of Empty Graves" and "Re-Examination" sound like the best pale ales taste -- perfectly balanced between a rich, malty speed metal base and the tart, hoppy melodic lines wiggling above. Elsewhere, Expulsion are merely very good songwriters and players. They've got an innate sense of song flow -- when to drop out the drums, when to thicken up the guitar harmonies, when to make an imperceptible time signature change and when to let lead guitarist R.B. loose for a shredding sessions -- that keeps Wasteworld tumbling ever forwards. Frontman A.B. adds a natural sense of coloring to his screams, grunts and bellows. It's impressive when a dude you can't understand 80% of the time possesses this much charisma. Wasteworld ain't my favorite album of the year, but it's definitely one that I'll keep coming back to.